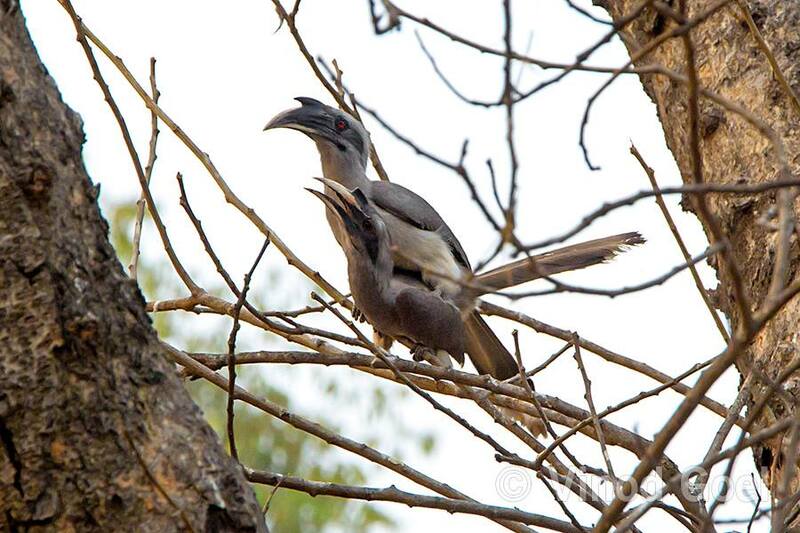 I have been observing Indian Grey hornbills, Oriental pied hornbills as well as Great hornbills in various National Parks of India right from 2004 but the activities of most common hornbill namely, the Indian Grey hornbill (Ocyeros birostris ) that is also found in urban environment hooked me when I went through the literature. 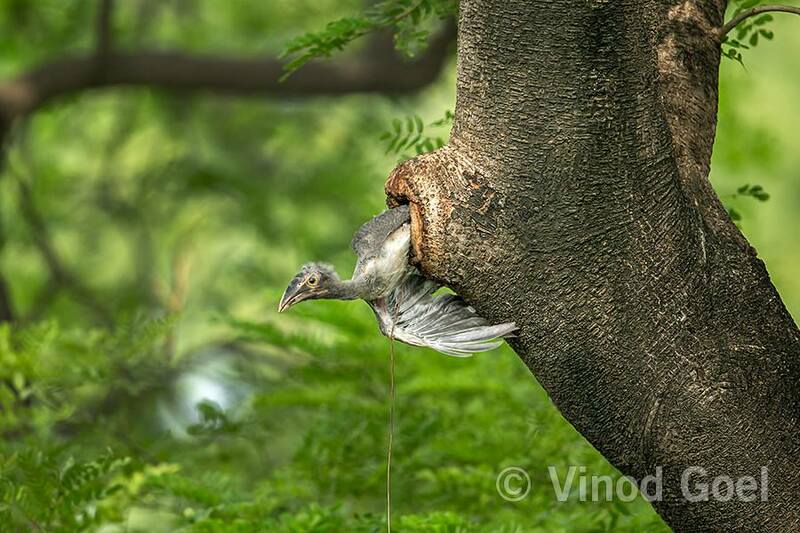 From then I have been closely observing its behaviour in heart of Delhi for more than 3 years. There are 54 varieties of hornbills in the world. 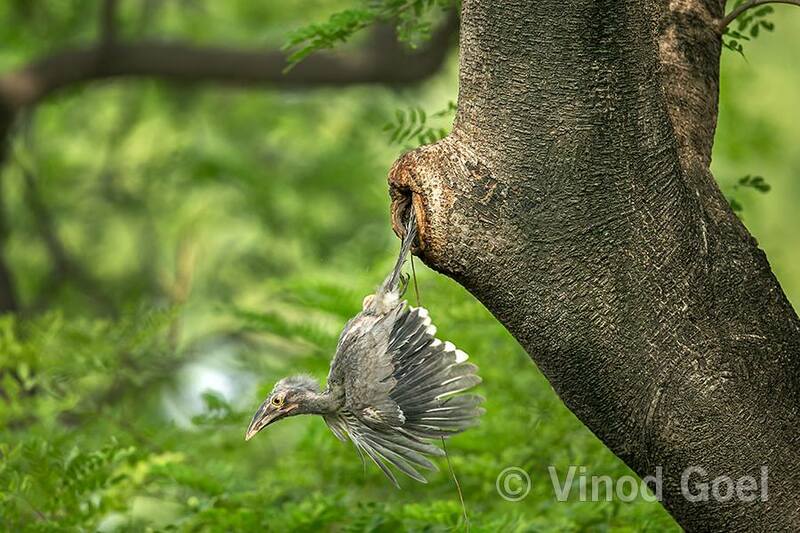 India has 9 species of these beautiful birds. Out of 9, two appears in the list of ten threatened hornbills of the world. In India, most of these are concentrated in north- east. 1. 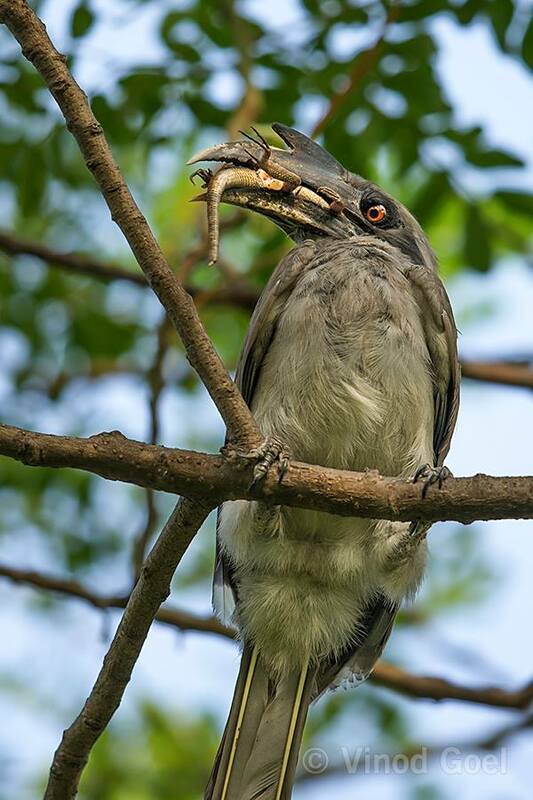 Indian Grey Hornbill 2. Great Hornbill 3. Malabar Grey Hornbill 4. Malbar pied Hornbill 5. Oriental pied Hornbill 6. Brown hornbill 7. Rufuous necked hornbill 8. Wreathed Hornbill 9. Narconda Hornbill. Another interesting fact about Hornbills is that they possess a binocular vision. This quality allows them to see their own bill tip and helps in precise handling of food items with their bill. Also, the eyes are protected by eye lashes. Hornbills nest in tree hollows. By and large they are monogamous. The pair selects a particular nest after proper recce. 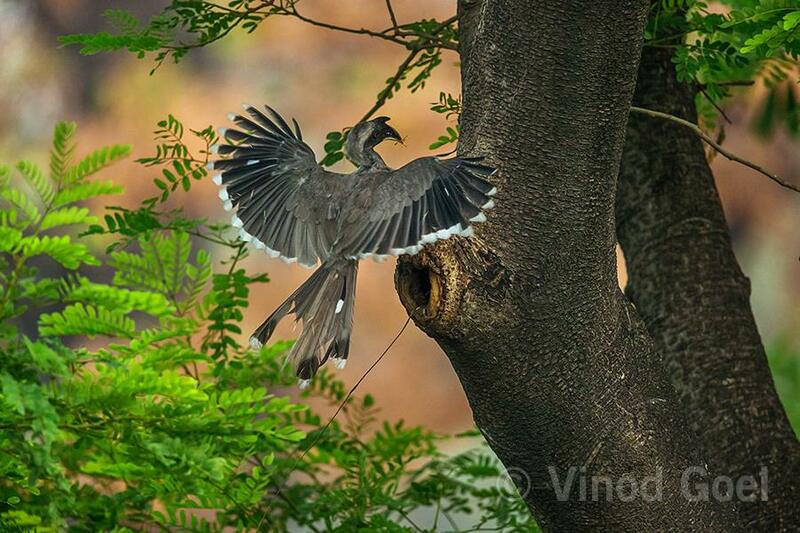 During courtship a male is usually seen chasing a female and gifting her bark of a tree, petals of flowers or fruits of banyan, peepal or mulberry to please her. During courtship they are in their own world and are least bothered about anything else. It is strongly believed that hornbills are faithful partners and usually mate on the same tree where they nest. After courtship and mating the female enters the hollow cavity of the nesting tree and stays there for around 75 to 90 days depending upon the species. This makes their nesting one of the most unique in the natural world. Even during entry I have observed the male helping and pushing the female into the cavity. There after he brings soil, pebbles and hand them over to the female who in turn seals the entrance with the help of soil and faecal material. She moults her feathers and lays eggs and incubates them. The eggs are hatched. The chicks are raised and when the space becomes insufficient for mother and chicks, she comes out of cavity and both the parents feed chicks. After sometime, even chicks also come out of the cavity. During initial few days their parents feed them. During the last 3 years I have been able to photograph the courtship including mating, entry of female into the nesting cavity and coming of a chick out of the cavity. 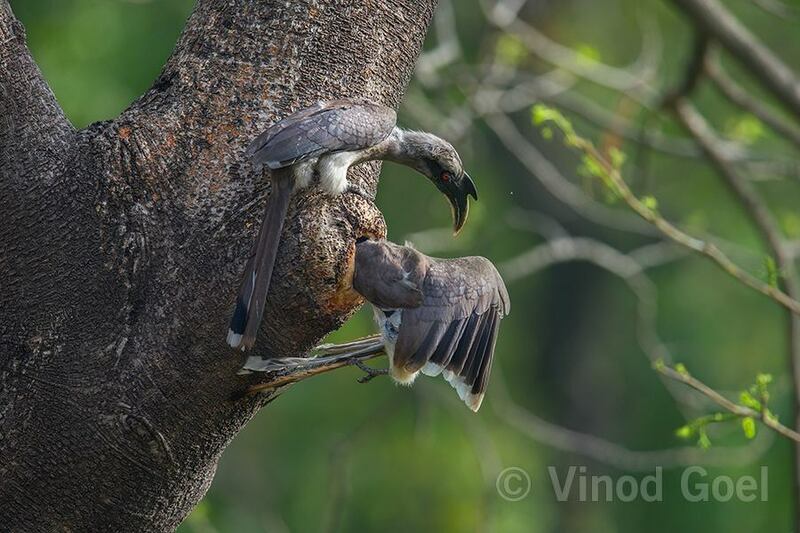 It was precisely on 2nd April 2015 when I observed the activities of male and female grey hornbill on the tree near the nesting hole. The female was preening and loving the male as if she knew that on that day she would enter the cavity and remain there for more than two months. To me it appeared, on one occasion, as if she was kissing the eyes of the male. Both of them were trying to spend as much time together and then the female starts making efforts to enter the tree cavity. The male was watching her and helping her sometimes. Slowly and slowly female entered into the cavity as her tail outside shrunk continuously until it disappeared .The male made sure that the his mate was comfortable and even peeped inside the cavity to assure himself. He flew and brought a mulberry fruit to offer to her as if to celebrate a big occasion in their lifecycle. I was fortunate to shoot the entire event through my tele-zoom lens. 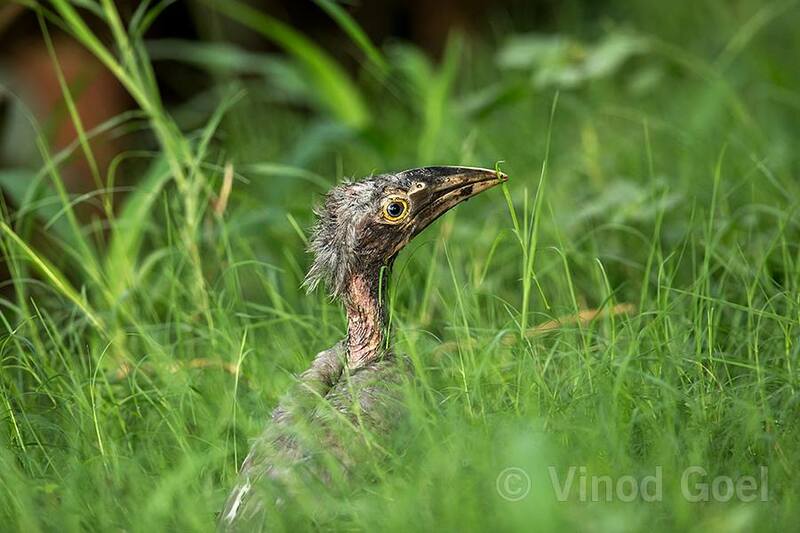 The female came out of the cavity in the 2nd week of June which I could not cover as I was in a National park near Delhi. On 8th July 2015 both male and female came to the nesting tree and male started feeding. The chick was turning its neck and it looked up as if asking his parents , when is the time to go out of the dark house ? He has been inside for a long time. When they left he took out his neck and was trying to come out, but a myna came and he had no choice except to move in. Finally when the feed was over and he had consumed a lot , chick started his journey to the unknown world where he would be fending for himself. It made all efforts and managed to take out his shoulder wings and then the whole body. 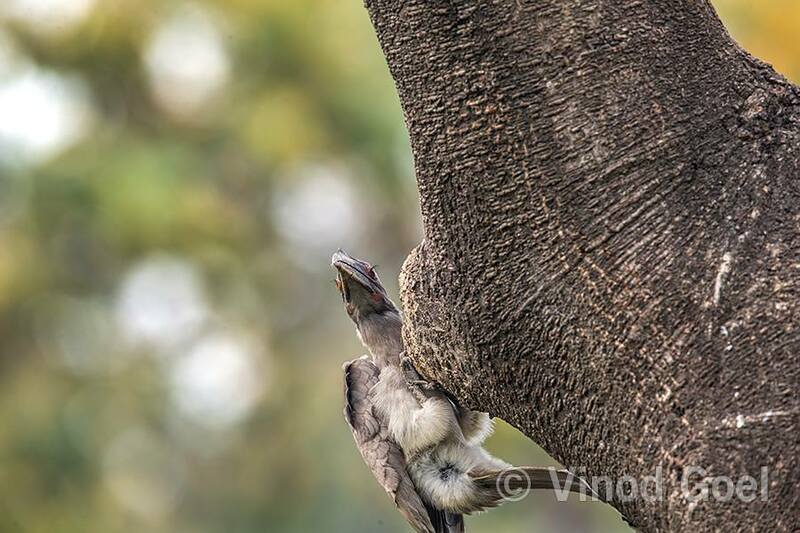 He spread his wings and glided to land on the land a few meters away from the base of the tree .As soon as he managed to land he was attacked by the two mynas who always disturbed his father in feeding their mother. He flew to avoid them and landed a few meters away. In the meantime I took out my camera with a 600 mm lense from the tripod and took some shots by holding the camera in hands. It again flew and disappeared into the bushes. When parents came they started searching their chick. Both of them screamed to attract the attention . But no response. They came to the outer most area of the tree and looked in all possible direction to look for their off spring . They flew in opposite direction where a gular (ficus racemosa ) tree exists. After waiting for some time I too looking into the bushes to locate the chick. After about 30 minutes I could see a dog coming from nearby bushes. I can not say whether the chick was devoured by the dog but its possibility can not be ruled out. I did not see the chick with the parents on any days to follow. That means as soon as the chick came out of his abode he became food and his journey was limited . It may be observed that female entered into the cavity on 2nd April 2015. Most likely the female came out on 14th or 15th June 2015 .First chick came out on 8th July . The whole process took about 98 days. During the year 2016 , I kept on improvising my shots. 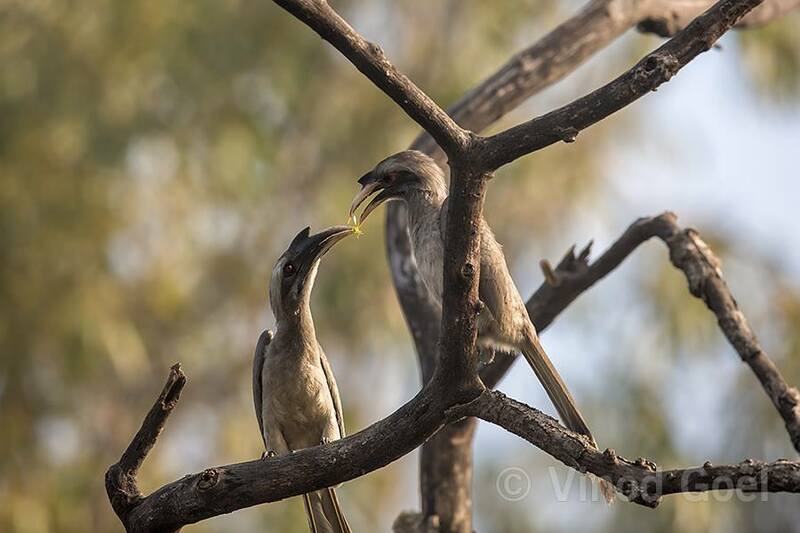 March is the month when Grey hornbills starts courtship, mating and entry in the cavity. 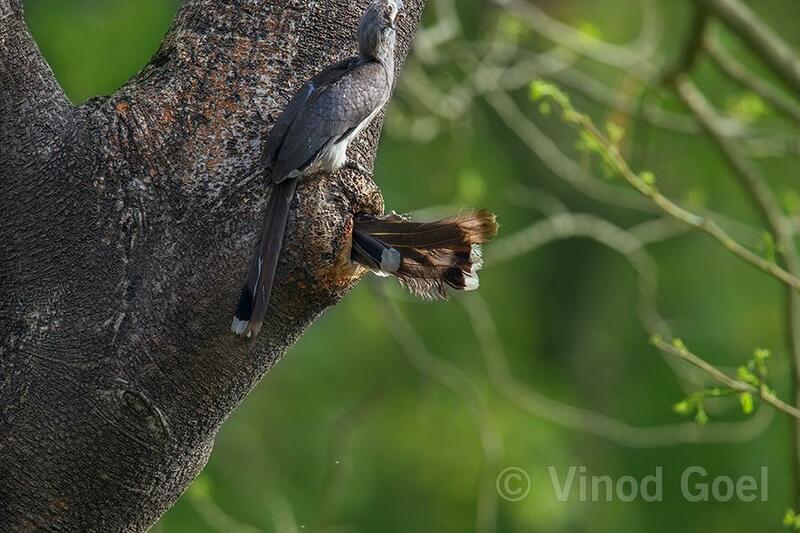 On 19th March 2016, I observed mating on a tree,male mounting over the female and turning of tail sideway by female so that the male can go for a cloacal kiss and genes from the male are passed to the female . Again on 20th March they were observed on the same tree. I found t he female was more active during the courtship as it was trying to woo the male. What I observed during the courtship was that the female mounted over the male and the tail was moved so that there could be contact of the sexual organs and the genes could pass on. The mating process continued for about 45 seconds and the female demounted. I could not believe my eyes. I thought whether I am in my senses or I am in my dreams . 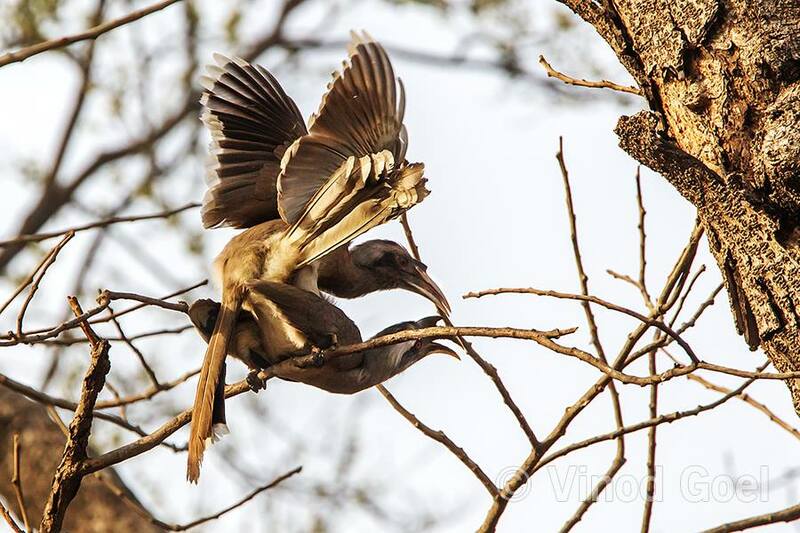 I then reviewed the shots and I could see what is unthinkable The female on top of the male during the mating process.Later on Bombay Natural History Society (B N H S )published the shot on their cover page of Newsletter for Birdwatchers in December edition. During this entire episode , ethics of wildlife photography have been observed by me. Enjoy the unforgettable journey from cradle to grave and unusual mating behaviour.